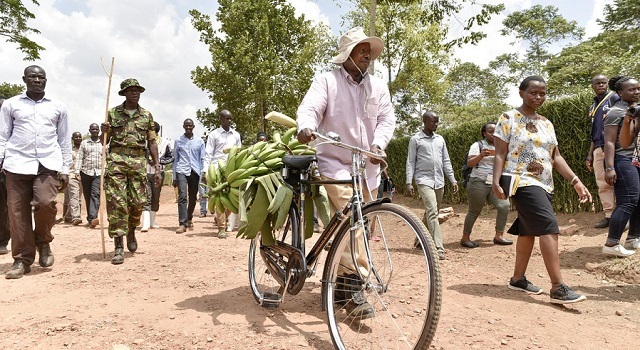 UGANDA (THE INDEPENDENT) -- Last week, President Yoweri Museveni tweeted a picture of himself pushing a bicycle in some village “promoting” an irrigation scheme. It was a masterstroke in the politics of dealing with peasants whose support he desires. The problem was the medium of broadcasting his initiative – Twitter. The Uganda social media crowd dislike Museveni. Being educated and urban, they see agriculture as a reflection of backwardness. I agree. No country where most people depend on agriculture for a livelihood is rich. Trying to help peasants become better at what they do may be good politics and even improve their lot but it cannot transform them. The future prosperity of Africa will depend on ending the peasantry. Ending peasantry has historically been accompanied by brutality, as I will demonstrate later in this article. African leaders, including Museveni, have been accused of being brutal towards their citizens. This, it has been argued, explains Africa’s inability to transform from poverty to riches. Yet African leaders do not seem willing to employ the level of brutality that countries in Europe used to eradicate the peasantry. For many years I believed it is the brutality and greed of African leaders that kept our people in poverty. Today I want to stand this argument on its head and argue that Africa is poor because its leaders (and elites broadly) are too kind to their people. This is because they have not broken free from primordial values of the peasants in villages from which the vast majority of them come. So they lack autonomy in the formulation of their values and decision-making processes. When reading the history the Western world, especially the United Kingdom and United States, I get appalled by the violence and brutality ordinary people had to suffer for capitalist transformation to occur. Even a casual reading of novels by Charles Dickens on the UK and John Steinbeck on the U.S. is enough to horrify anyone about the tragic effects of this transition. In the UK, masses of people were displaced through wholesale land-grabbing called the “Enclosure Movement.” The aim was to open up these lands for commercial agriculture; to rear sheep – because wool had become very profitable. What followed? Deprived of his right to use common land, the peasant could not maintain himself as a farmer. And since there weren’t factories to employ him, he became an agricultural worker – reunited to the same land through the agency and initiative of capital – or became a beggar, a robber, often a pauper. The English parliament, terrified by paupers, passed laws tying them in designated workhouses which one clergyman called “Houses of Terror”. Those found wondering (often looking for work) were declared vagabonds and would be whipped, branded, and mutilated. That is how the UK created an industrial working class out of the peasantry. The government and elites of UK were not “kind to their people” as many British citizens and African elites reading re-written British history have come to believe.